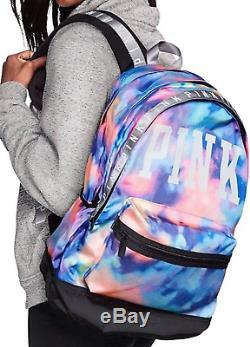 Tie Dye Multi-Color Large Backpack. Measures: 8"D x 12"W x 18H. One top deep slash pocket. All items are from Pet and Smoke FREE environment! All items come from a pet and smoke free home. If by some off chance you do receive an item you're not happy with, contact me prior to leaving feedback! I don't do local pick ups. Only unused & unopened items will be accepted. Thank You and we do appreciate your business! 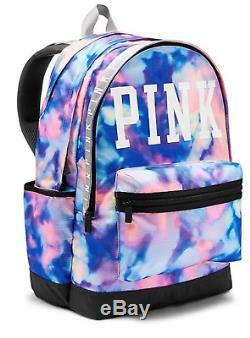 The item "NWT VICTORIA'S SECRET PINK 2017 MULTI-COLOR CUTE TIE DYE CAMPUS LARGE BACKPACK" is in sale since Sunday, December 17, 2017. This item is in the category "Clothing, Shoes & Accessories\Women's Bags & Handbags". The seller is "sveco2010" and is located in Palm Coast, Florida. This item can be shipped worldwide.